In order to sell or promote products on the web you must provide good product information in order to give your customers confidence before they click the buy button. When customers shop online they require more product information compared to shopping for the same items in brick and mortar shops as there is no tangible product to hold no salesperson to ask and no product displays to read. As a result of poor product information many ecommerce websites are losing sales to competitors who are spending the time to make shopping online as painless as possible for their consumers. 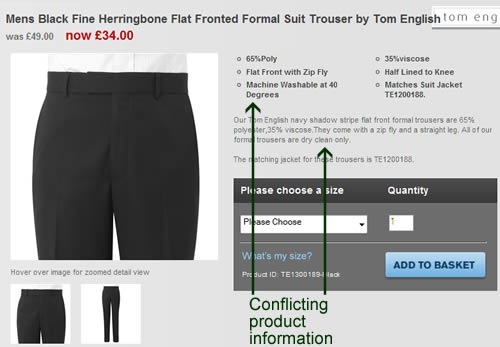 Here’s an example of a few misleading ecommerce pages from a large UK clothing store. In this case the product has several images and a decent amount of product information. However when would you realise that you were only buying the shirt and not the matching tie? 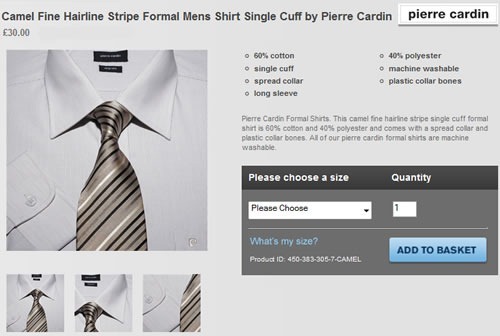 It doesn’t mention anywhere that the tie is not included or sold separately. Another item from the same store features a pair of suit trousers, but if you look more closely you’ll notice the conflicting product information. Are they machine washable at 40 degrees or dry clean only? After looking at these two products would you have confidence purchasing items from this store? User Experience (UX) is what a user experiences while interacting with your website and encompasses everything from how easy it was to find the site to the journey a user takes through the site. User experience is understanding and designing a user’s experience from start to finish, not just how the website looks or functions. The aim is to improve the user journey - ironing out those frustrating fly-out menus, optimising the shopping cart processes and making the website more intuitive by placing information where users expect to find it. User Experience is user focused, so the first step is to identify and understand your audience and find ways to communicate with them effectively. You shouldn’t assume a user is familiar with your product offering or knows all your industry terminology. Understand what tasks end users will want to perform on your website and create a series of use-cases to identify each task. While you and your web design company know how to navigate your website, do your users? The only way to find out for sure is to perform user testing. The best way to evaluate a website’s user experience properly is by assigning tasks to real users and monitoring their progress in achieving the tasks. Users should ideally be recorded and asked to think out loud while carrying out the assigned tasks so you can understand their thought processes while navigating. It’s important that the users picked to perform the tasks haven’t been involved with the design or development process. Information gleaned from user testing is then fed back into the design process in an iterative manor to improve the end user experience. Iterative design can help optimise sign-ups, maximise return on investment (ROI) and increase sales, so it has real benefits! Information Architecture put simply is the planning stage of a website and involves organising and designing the structure or "blueprint" of a site and should be carried out before any design or development takes place. Here is a good example of the importance of Information Architecture. You must consider the end user when deciding what categorisation to use for website product navigation. We could categorise a company's products by brand, model number, manufacturer, or by function but which is best? What makes the most sense to the customer? Will a customer who is new to our products/brand be able to find what they're looking for? Will a user who knows what product they need be able to find it quickly? Some websites make the mistake of only categorising products by brand/model or manufacturer and using this as the product navigation on their website. In this case customers who are not familiar with the company's products will struggle to find what they are looking for. For example, the Peugeot UK website categorise their cars by model number, 107, 207, 308, 3008, 407, 4007, 807 etc. As a potential customer who is not familiar with Peugeot's model numbers I don't know what models to consider if I'm looking for an estate car. Do I click through every model category to try and find what I'm looking for or give up?